Why would secondary sanctions against North Korea be any different from secondary sanctions against Iran? While tensions continue to flare along the Korean peninsula, the Trump administration struggles to articulate its strategy to persuade North Korea to halt its nuclear program. In a recent visit to the de-militarized zone, Vice President Pence warned Pyongyang to not test America’s “strength and resolve,” citing recent U.S. military strikes in Syria and Afghanistan as a forewarning. A not-so-veiled threat that the Trump administration considers “all options” to be on the table. What is unknown, however, is whether this increased rhetoric is merely saber-rattling or is the opening salvo for aaf true shift from Obama’s doctrine of “strategic patience.” That is, continuing to apply political and economic pressure until Pyongyang returns to the negotiating table. Since 2006, Pyongyang has conducted five nuclear tests — a possible sixth may be on the way. In weighing its options, the Trump administration has decided to take a rather opaque approach of “maximum pressure and engagement.” While the details of “maximum pressure and engagement” are somewhat thin, it is quite likely that secondary sanctions — or the threat of secondary sanctions — will play a significant role. In fact, some in Congress have already called for Trump to tighten U.S. economic and financial sanctions against North Korea, even calling for a ban from SWIFT, the international financial messaging system. David S. Cohen, an Obama administration Treasury official, argues that Trump should “take a page out of the Obama administration’s Iran sanctions playbook” and apply secondary sanctions against those who do business with the North Korean regime. This now seems even more likely. This past week, the White House held a briefing for all 100 U.S. Senators on the North Korean threat — a move leaving many in Washington perplexed. After the briefing, however, officials announced that the Trump administration would pursue a strategy that includes tightening economic sanctions against North Korea, including businesses that deal with the regime. In part due to the successful Iran negotiations, secondary sanctions have achieved somewhat of a mythical status as panacea to solving the crisis du jour. There is little doubt that U.S. and global economic and financial sanctions played a key role in bringing Tehran to negotiate an agreement over its nuclear program — how significant, though, is still largely unknown. But, should Congress and the Trump administration, eager to replicate the success of Iranian sanctions, expect similar results with respect to North Korea? The reality is that pursuing an unrestrained and unmitigated policy of secondary sanctions may punish the United States, both directly and indirectly, as much as it punishes North Korea. What are secondary sanctions? Secondary sanctions, sometimes referred to as extraterritorial sanctions, are an often discussed but rarely understood policy instrument. Whereas primary sanctions apply restrictions directly to U.S. persons and companies, secondary sanctions leverage the strength and role of the U.S. financial system to target businesses and persons outside the typical jurisdiction of the United States. Generally, these types of sanctions focus on blocking or restricting foreign banks’ access to the U.S. financial system. Interestingly, secondary sanctions are more often threatened than actually used. With respect to Iran, for example, only two foreign banks were subjected to the extraterritorial provisions of the Comprehensive Iran Sanctions and Divestment Act — the Bank of Kunlun in China and Elaf Islamic bank in Iraq in 2012. Both banks were found to have facilitated “significant” transactions on behalf of sanctioned Iranian entities. Although China took actions to isolate the Bank of Kunlun, Beijing lashed out at the U.S., suggesting the sanctions would jeopardize U.S.-Sino relations. While it does not appear that the sanctions against the Bank of Kunlun had any significant lasting repercussions, there is evidence to suggest that these instruments politicize the global financial system. Such was the case in 2007, when the United States designated Banco Delta Asia — a Macau-based bank — under Section 311 of the USA PATRIOT Act. The Treasury Department determined that the bank was knowingly laundering illicit proceeds on behalf of North Korea. Although not quite a secondary sanction, the designation required U.S. banks to take significant steps to ensure that its customers were not conducting business transactions with Banco Delta Asia. Consequently, other, non-U.S. banks took similar steps, not wanting to risk a U.S. enforcement action. Practically overnight the bank was frozen out the U.S. financial system. After North Korea returned to the six party talks in early 2007, the U.S. released funds frozen as part of the Banco Delta Asia action, despite the bank not improving its anti-money laundering and compliance protocols. For many in the anti-money laundering and compliance communities, this was seen as a dangerously political move. When policymakers discuss imposing secondary sanctions against North Korea, they are, in reality, discussing imposing sanctions against Chinese businesses and banks. This, of course, is because China is North Korea’s largest trading partner and provides a lifeline to accessing global markets and financial services. During North Korea’s “Day of the Sun” parade this year, which marks the birthday of the country’s founding leader, Kim Il-sung, Kim Jong-un could be seen arriving in a fleet of Mercedes-Benz Maybachs. Having no trade ties with the European Union, the presence of such luxury automobiles is surely a curious site in Pyongyang. The flagrant display of such goods only underscores the extent of North Korea’s global networks of front companies, which facilitate everything from purchasing high-end whisky to conventional arms. None of which would be possible without assistance from the Chinese financial system. In fact, according to the recent UN panel of experts report, North Korea’s global procurement networks have increased in both sophistication and scale, able to access formal banking channels with relative ease. These methods include exploiting correspondent banking relationships at foreign financial institutions, forming joint ventures, and relying on trading companies to perform financial services. Take, for example, the Bank of Martial Arts, which is located in Pyongyang and services its clients in renminbi-denominated accounts. The report also sheds light on the operations of the North Korean banks Daedong Credit and Korea Daesong — each maintain representative offices in Dalian, China. This “backdoor access” to global banking networks practically neutralizes any sanctions regime. Why would secondary sanctions against North Korea be any different from secondary sanctions against Iran? First, it is important to consider that Iran was already largely cut off from the global financial system — especially among the United States’ chief economic partners. Meaning, the risk for blow-back was relatively small. Some economists would argue that imposing secondary sanctions against China would do little economic harm to U.S. interests, citing the massive trade deficit between the two countries. Sure, almost 19 percent of Chinese exports, worth nearly $458 billion, are bound for the United States. But, this perspective ignores the indirect effects of injecting uncertainty into the global financial system, which has the potential to destabilize other markets. Second, the U.S. dollar and banking networks play an instrumental role in global trade and commerce, and are key to effective secondary sanctions. 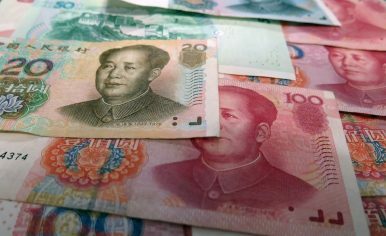 According to the Bank for International Settlements — essentially the bank for central banks — claims denominated in U.S. dollars on Chinese banks (from reporting countries) top $598 billion, almost 68 percent of claims. Also, almost 37 percent of Chinese banks’ cross-border liabilities are denominated in U.S. dollars. This is significant leverage for Washington. But, as global banks face increased risks and uncertainty, they could potentially move away from the U.S. dominated financial system. This comes at a time when China continues to see the globalization of its currency, the renminbi, and countries like Russia look for alternative payment systems and clearinghouses to reduce exposure to U.S. influence. In fact, the secondary sanctions against Iran created so much risk and uncertainty, that banks are still reluctant to return to Iranian markets, stunting Iran’s return to economic normalcy. Each year, increased regulation pushes banks’ compliance and due diligence costs higher. According to the U.S. Financial Crimes Enforcement Network, U.S. banks filed almost 5 million suspicious activity reports in 2016 and spent an estimated $8 billion on compliance and due diligence. A recent survey published by the Association of Certified Anti-Money Laundering Specialists found that 40 percent of respondents have exited entire markets due to regulator risks and increased costs. Moreover, 33 percent plan to exit markets within the next year. Despite Trump’s promise to unburden the financial industry from regulation, anti-money laundering regulations do not appear to be on that list. In other words, global banks are becoming quite sensitive to the increased costs associated with sanctions compliance. What should be done? China has taken some, albeit limited, steps towards implementing UN sectoral sanctions. In February, Beijing announced that it would stop imports of North Korean coal, which is the country’s main export to China. To be sure, leaning on China is likely the key to finding a solution with North Korea. Washington, however, must find a way to do so without jeopardizing U.S. economic interests or position within the global financial system. Instead of imposing secondary sanctions, the U.S. should first identify ways to cooperate with China, especially insofar as sharing financially-derived intelligence. This would be step in the right direction that promotes greater compliance with global anti-money laundering standards, as well as increasing transparency on North Korea’s access to the global financial system through Chinese financial institutions. A place to start would be to utilize the Egmont Group — the international body of states’ financial intelligence units that provides a platform for information sharing. To be sure, not carefully calibrating secondary sanctions runs the risk of politicizing the global financial system, which may have significant blowback effects on the United States. If perceived as overly political, or overused, banks may begin to look for alternatives to the U.S. dominated financial system — leaving the United States without a lever.